Description: This Motorcycle Cat is inspired by the Motorcycle Street Meet that will be held on August 4th on Main Street in Cairo. 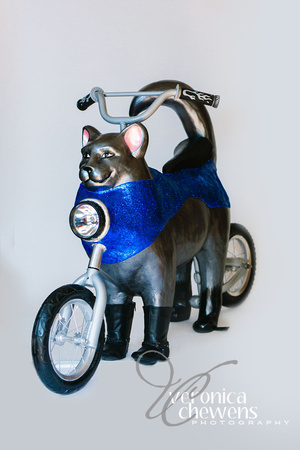 The cat will be incorporated into the form of a motorcycle, and a small bear will sit in the seat as the rider. Both cat and bear will be dressed in motorcycle garb to match the companion Biker Bear from the Cairo Bears Are Back community art project. 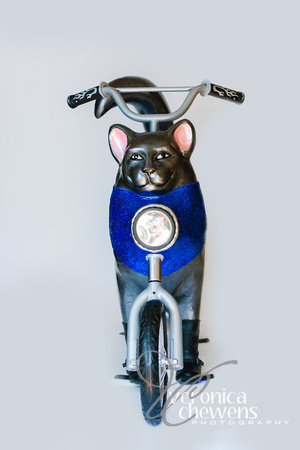 By exchanging Biker Bear to Catskill and Motorcycle Cat to Cairo, we hope to foster interest in both Cat’N Around Catskill and Cairo Bears with co-advertising of both event. About the Artist: Christie Hicks moved to the Hudson Valley in late 2014 when her husband Kevin retired from the army to enjoy the tranquility of the area and the beauty of the mountains. She studied graphic design and fine arts at Columbia-Greene Community College in Hudson. The creative outlet these classes provided inspired her to submit a design for Cat’n Around Catskill. Christie looks forward to participating again this year in this amazing fundraiser for Catskill.